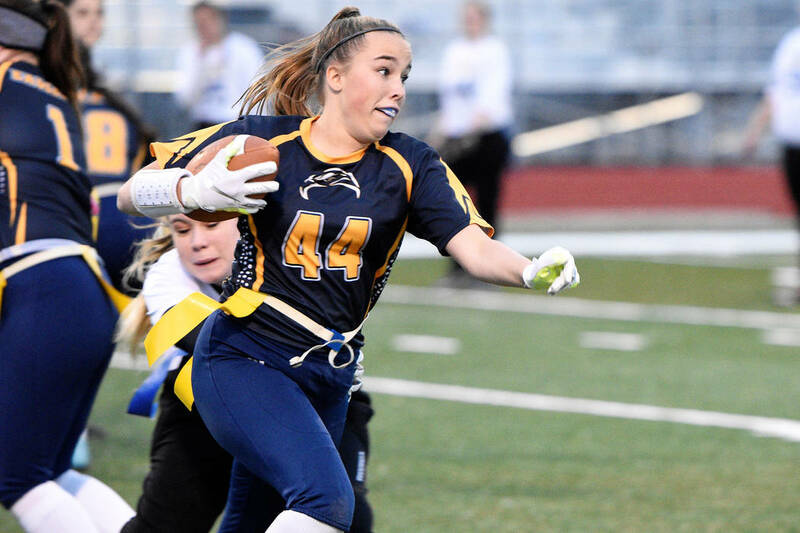 (Robert Vendettoli/Boulder City Review) Boulder City High School junior Makena Arboreen rushed for 31 yards on seven carries and catching five passes for 25 yards in the Lady Eagles' 28-13 victory over Moapa Valley on Tuesday, Jan. 29. Coming off of a 33-12 loss to Sunrise Mountain on Friday, Jan. 25, the Lady Eagles came out assertive against the Pirates, making smart decisions to move the ball effectively. The Lady Eagles controlled the game early, using their rushing attack to pick up key first downs before junior quarterback Makaela Perkins capped off drives with touchdowns. Looking poised and confident against the Pirates, Perkins completed 13 of 22 passes for 102 yards and three touchdowns. In sync with senior Elizabeth Taggard, they linked up three times in the end zone. Keeping defenses honest with a balanced offensive attack, senior Ryann Reese rushed for 102 yards and a touchdown on 16 carries, while Junior Jasmyn Curl rushed for 63 yards on 10 carries. Junior Makena Arboreen added another threat out of the backfield, rushing 31 yards on seven carries and catching five passes for 25 yards. Picking up a 33-0 victory against Valley on Jan. 23, Arboreen caught six passes for 103 yards and two scores, while rushing for 22 yards and a touchdown on three carries. On defense, Arboreen made nine tackles. Perkins completed 14 of 23 passes for 162 yards and a two touchdowns against the Vikings; Curl rushed for 137 yards on 10 carries. Against Sunrise Mountain, Perkins completed 15 of 31 passes for 133 yards and two touchdowns, but also threw two interceptions. Taggard caught seven passes for 39 yards and both scores. Sitting third in the 3A Southern League, the Lady Eagles look to close out the season strong against stiff competition, avenging earlier season losses. Boulder City travels to Del Sol on Friday, Feb. 1, before hosting Virgin Valley on Tuesday, Feb. 5.